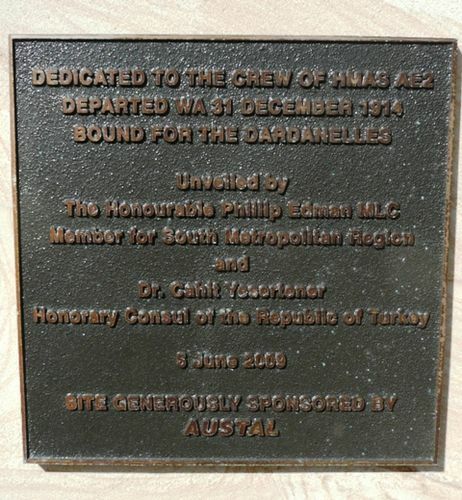 A series of plaques commemorates the Royal Australian Navy submarine, AE2 which left Fremantle to travel to the conflict in the Mediterranean Sea during World War One. At the start of World War One, the AE2 was sent to German New Guinea with the Australian Naval and Military Expeditionary Force and spent time patrolling around Fiji. With no need for submarines in the Pacific or Indian theatres, AE2 was towed to the Mediterranean, and arrived off Egypt in early 1915, and was assigned to campaign in the Dardanelles. It was the first submarine to successfully penetrate the waterway and entered the Sea of Marmara. She operated for five days before mechanical faults forced her to the surface, where she was damaged by the Turkish torpedo boat Sultanhisar. The AE2 was scuttled and all of the crew was captured. The AE2 was the only Royal Australian Navy vessel lost to enemy action during World War One.